A scanning electron micrograph of a ten-million-year-old Archaea. all unicellular organisms lacking nuclei—the prokaryotes —as bacteria proved inaccurate too. It took a different way of looking at life to recognize that a group of prokaryotes, the Archaea, actually represent a third major form of life, necessitating invention of a term to supercede kingdom, the domain. The three domains of life are the Bacteria, the Archaea, and the Eukarya. Evidence obtained so far indicates that the Bacteria and Archaea diverged from a common ancestor about 3.7 billion years ago, and somewhat later the Archaea diverged from the lineage that would become the Eukarya. Carl Woese, a microbiologist at the University of Illinois, identified the Archaea and proposed the three-domain system of classifying life in 1977. Traditionally, microbial classifications were based on superficial similarities, such as shape, habitat, or method of acquiring energy. This approach did not necessarily group organisms that are the most recently descended from shared ancestors. That is, traditional classification considered similarities, but not evolutionary relationships. For example, Thermus aquaticus and Thermoplasma volcanium both are thermophiles, thriving in hot springs, but the former is a bacterium, and the latter an archaeon. They are not closely related at all, but live in similar surroundings. In the early 1970s, Woese and others began comparing nucleic acid sequences to discover the evolutionary relationships among microorganisms. Woese focused on ribosomal ribonucleic acid (rRNA) because these are very important molecules that are therefore unlikely to have changed much over evolutionary time. The more alike the rRNA sequences were between two microbes, the more recently they shared an ancestor. Because nucleic acid sequencing had not yet been invented, Woese used an indirect method to compare rRNA sequences. He cut rRNA molecules into pieces with enzymes , then visualized the pieces in size order using a technique called autoradiography. Different patterns of rRNA pieces characterized the prokaryotes known at the time (bacteria), and the eukaryotes. At the suggestion of a colleague, Woese ventured beyond probing the rRNAs of common laboratory strains of bacteria and analyzed a microbe that a graduate student had collected from a nearby septic system. These microorganisms were methanogens; they produced methane (swamp gas) from hydrogen and carbon dioxide in the environment. Surprisingly, the rRNA pattern for the septic system microbe lacked some of the pieces that had been identified in more than forty types of bacteria, and had some mysterious spots of its own. Woese found other methanogens that didn't fit the expected prokaryotic pattern or rRNA fragments. By 1977, he and his colleagues published a landmark paper that described ten species of methanogens that "appear to be only distantly related to typical bacteria" (Woese 1977, p. 5088). Even though further publications continued to make the case for two types of prokaryotes, the idea of domains in general, and of the newly distinguished archaea in particular, took a long time to gain acceptance. Confusion arose over the initial naming of the "new" organisms as "archaebacteria." They are not bacteria; they are archaea. Since 1977, microbiologists have identified and described several more members of domain Archaea. An initial misnomer was that these microbes are only found in what scientists call extreme environments, such as hot springs and deep-sea hydrothermal vents. Continued research showed that this is not the case. Archaea have been found in rice paddies, soils, swamps, freshwater, and throughout the oceans. As more microbiologists came to accept the idea that archaea are not bacteria, more distinctions emerged. Archaean transfer RNA (tRNA) molecules differ in sequence from their bacterial or eukaryotic counterparts. Archaean cell walls lack the peptidoglycans that are part of bacterial cell walls, yet archaean cell membranes include lipid molecules not seen in other types of organisms. Archaea make methane using different enzymes than do bacterial methanogens. Archaeans are sensitive to different antibiotic drugs than are bacteria, indicating a basic difference in cell structure. However, archaea also share characteristics with members of the other two domains. They have some of the same surface molecules as bacteria and transport ions in much the same way. But archaea have proteins associated with their DNA that resemble the histone proteins of eukaryotes and synthesize proteins in a way similar to that of eukaryotes. Also like eukaryotes, archaean genomes have more genes interrupted with intron sequences, and more repeated sequences, than do bacterial genomes. Genome studies confirm that the archaea mix characteristics of the other two domains of life, and much more. A team from The Institute of Genomic Research (TIGR), which included Carl Woese, published the first genome sequence of an archaeon in 1996. The researchers collected samples of Methanococcus jannaschii from a "white smoker" chimney 2,600 meters (over 8,500 feet) deep in the Pacific Ocean, an environment that lacks oxygen and has extremely high temperature (near 85 degrees Celsius [185 degrees Fahrenheit]) and pressure (exceeding 200 atmospheres). Of M. jannaschii 's 1,738 protein-encoding genes, more than half are unknown in other organisms. Analysis of its genes revealed that its metabolism , cell surface, and ion transport mechanisms resemble those of bacteria, yet its DNA replication and protein synthesis mechanisms are more like those of eukaryotes. Two years later, TIGR sequenced a second archaeon, Archaeoglobus fulgidus. 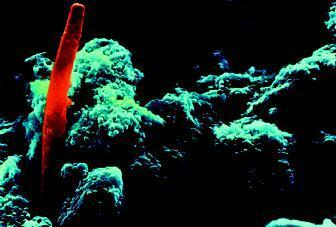 Now researchers could compare archaea. Although A. fulgidus resembles M. jannaschii in DNA replication, protein synthesis, and biosynthetic pathways, it differs markedly in how it senses the environment, moves substances into and out of cells, and regulates metabolism. One quarter of A. fulgidus' genes encode proteins that are uncharacterized, but two-thirds of them are also found in M. jannaschii. Half of A. fulgidus' proteins are known in other organisms. However, one-quarter of its genes are not known, even in M. jannaschii. A. fulgidus is a thermophilic anaerobe like J. jannaschii, but also leads a very different lifestyle in that it metabolizes sulfur. In 1999, TIGR introduced the genome sequence of another archaeon, Aeropyrum pernix K1. It differs from the other two in that it lives in the presence of oxygen, but it also has many unique genes. Compared to other types of organisms, biologists know very little about the archaea. However, the diversity seen among the few known types indicate that not only are the members of this third domain of life quite distinctive from members of the others, but they also differ from each other. Bult, C. J., et al. "Complete Genome Sequence of the Methanogenic Archaeon, Methanococcus jannaschii." Science 273 (1996): 1058–1073. The Institute for Genomic Research. <http://www.tigr.org> . Lewis, Ricki. "Going Out On a Limb for the Tree of Life." In Discovery: Windows on the Life Sciences. Malden, MA: Blackwell Science, 2001. Woese, Carl R., and George E. Fox. "Phylogenetic Structure of the Prokaryotic Domain: The Primary Kingdoms." Proceedings of the National Academy of Sciences 74 (1977): 5088–5090.